Chefs and bartenders from Anchorage and the Mat-Su area prepared plated desserts, dessert cocktails and edible centerpieces for judges and participants to sample and vote for. Anchorage residents put their sweet tooth to good use at the second annual Sweet Rivalry event, a baking competition that raised around $30,000 for Alaskans who experience intellectual and developmental disabilities. Nine competitors each had 60 minutes to create a work of dessert art on a plate. Each group was given a secret ingredient to work with: maple pecan. Some chefs kept it simple, like a chocolate hazelnut cake from Glacier Brewhouse. Others were more creative. Kaladi Brothers and Phat Kid Food Truck presented a beet sponge and potato funnel cake with charcoal gelato. Yes, real charcoal. Bee pollen, edible flowers and butterscotch were used as garnish. The dessert that won was from Dipper Donuts. 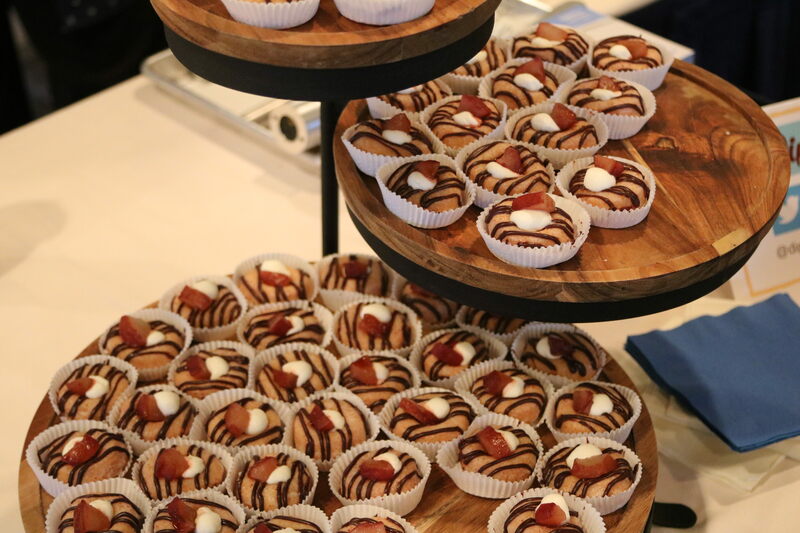 Co-owner Laura Cameron took first place for salted brown butter donut holes with dark chocolate creme brulee and a port wine poached pear on top. Cameron was happy to gain attention for her shop, which is opening in November. “We just want customers to be able to taste our donuts, and so far it’s going pretty well,” Cameron said. Then, there was the edible centerpiece competition, where Lindsay Kucera, sous chef of Rustic Goat, and her team made an Alpenglow Napoleon that won first place. Their dessert had layers of homemade puff pastry, with cardamom and labrador tea marshmallow fluff, filled with cranberry fluid gel and a crab apple butter with chai spices. Kucera said she used local ingredients. Part of the proceeds from the event go towards The Arc of Anchorage’s studio and gallery, Sparc. The gallery provides a space for individuals with sensory issues or other challenges to learn ceramics, painting, beading and even cooking.